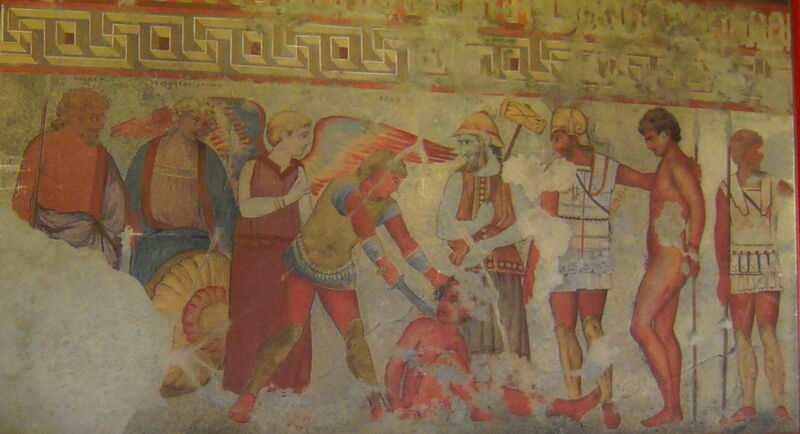 Unknown, Fresco in the François Tomb (copy by Augusto Guido Gatti in 1931 of original from c 340 BCE), Vulci, moved to Villa Torlonia già Albani, Rome. By Battlelight, via Wikimedia Commons. Some narrative paintings need thinking about, to understand their story properly. Sometimes, the more that you think (and read) about a particular painting, the more puzzling it becomes. Take the two paintings which I recently showed from an Etruscan tomb, excavated by and named after Alessandro François, in 1857. Unknown, Liberation of Caelius Vibenna (copy by Carlo Ruspi of original from c 340 BCE), the François Tomb at Vulci, moved to Villa Torlonia già Albani, Rome. By Louis-garden, via Wikimedia Commons. The Liberation of Caelius Vibenna (c 340 BCE) shows a captive being freed at the left, then a series of quite gruesome killings. Opposite that painting in this tomb was a fresco showing someone calmly beheading a naked youth, which I interpreted as being the sacrifice of Trojan prisoners. Don’t these strike you as odd scenes to have painted in your family tomb? Given that the Trojans were taken prisoner around a millenium earlier, even an Etruscan warrior proud of those whom he had killed would seem to have odd tastes for their interment. Who was doing what to whom? The first step in discovering what these paintings are really about, and how they come to be there, is to identify the figures shown, and the actions taking place. 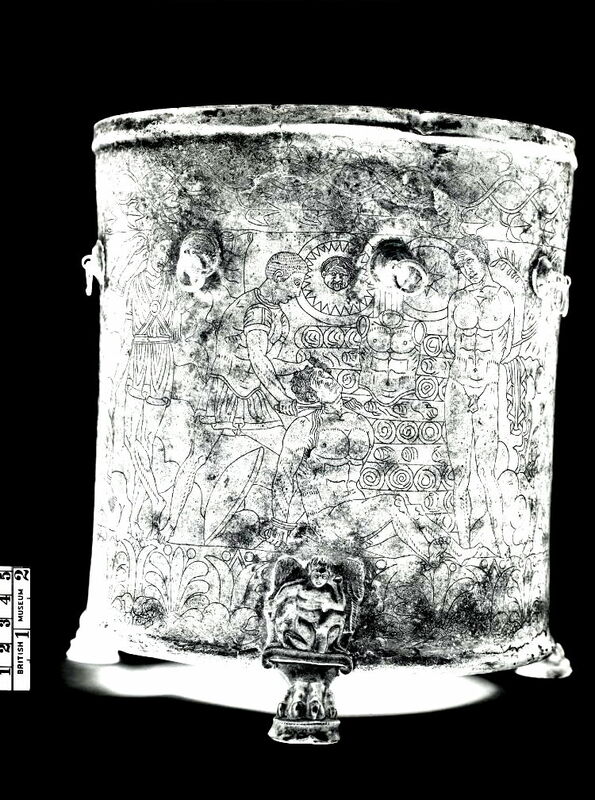 This is difficult for Etruscan art, because, unlike the Greeks and Romans, they left virtually no written texts which might help us, and almost all that we know about them has come from the study of their tombs and grave-goods. Thankfully there are now some excellent accounts written by scholars, which I will rely on. the Etruscan hero Aule Vipinas (Aulus Vibenna, brother of Caile or Caelius) kills someone whose name is lost, but was an ally of Rome). Note that each Etruscan hero is carefully made to look the same, with the same brown hair and beard, to aid identification. During the troubled years prior to Macstrna/Mastarna becoming King of Rome, some Etruscans allied themselves with Rome. The killings shown here were part of a surprise attack by loyal Etruscan warriors on those allies of Rome, which the heroes inevitably won. This painting is therefore a celebration of that victory as an achievement of loyal Etruscans some two centuries previously. Those who fancied even more gore could peek around the corner into the vestibule of the tomb, where there is a painting of Marce Camitlnas thrusting his sword into a subjugate Cneve Tarchunies Rumach, better known as Gnaeus Tarquinius, a Roman who may have been involved in the capture of the brothers Caile and Aule Vipinas (Caelius and Aulus Vibenna). These paintings appeared on one side of the tomb; the other side contained the far older Greek narrative of the sacrifice of the Trojan prisoners, a more sophisticated painting which was almost certainly copied in part from a Greek original. Other similar images have been found in Italy, such as the Revil Cista shown below. Locrian Ajax, who drowns returning from Troy, and is holding another Trojan slave off the right edge of this image. To understand these, we must go back to the legend of the Fall of Troy. Troy was a legendary (and probably historical) city which ruled over a substantial area of the west of what is now Turkey. Designed to be impregnable, it had accumulated considerable riches when the early Greek civilisation was becoming established. Eris, the goddess of strife and discord, gave a golden apple “for the fairest” woman, leading to a contest between the goddesses Athena, Hera, and Aphrodite. This was judged by Paris, son of King Priam of Troy. 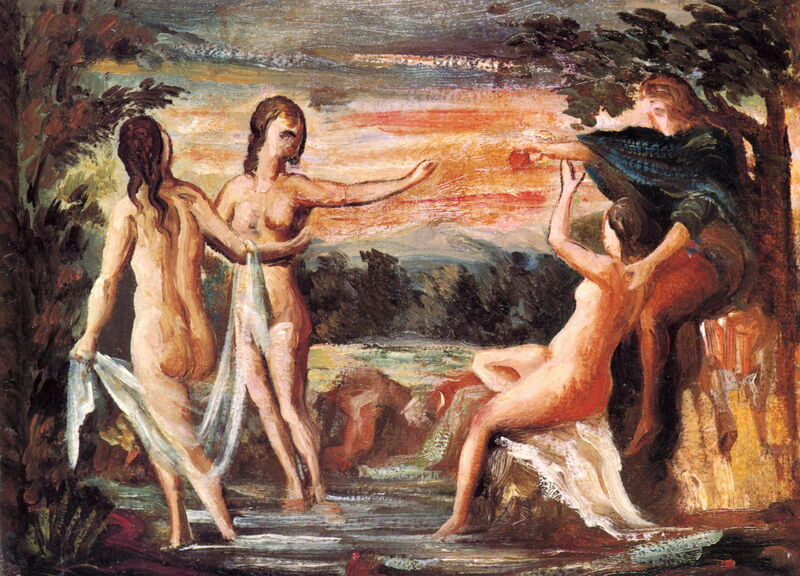 Paul Cézanne (1839–1906), The Judgment of Paris (1862-4), oil on canvas, 15 x 21 cm, Private collection. Wikimedia Commons. The goddesses played dirty, and each promised Paris a reward should he choose them. When he chose Aphrodite as the winner, she had promised him the hand of the most beautiful woman in the world, Helen, who also happened to be married to the King of Sparta, Menelaus. Aphrodite then helped Paris seduce and abduct Helen back to Troy. When Helen was being courted, her unsuccessful suitors formed a pact to return her to Sparta in the event that anyone dared try to seduce her, and Agamemnon, King of the Mycenaeans and brother of Menelaus (so brother-in-law of Helen) raised a fleet of more than a thousand ships (“was this the face that launched a thousand ships?”) and a great army to attack Troy. For ten years, the Mycenaeans (Greeks) and their allies laid siege to Troy, during which many of their heroes were killed in battle. The war was not just long, but very bitter, and the warriors became vengeful, and both sides committed atrocities. 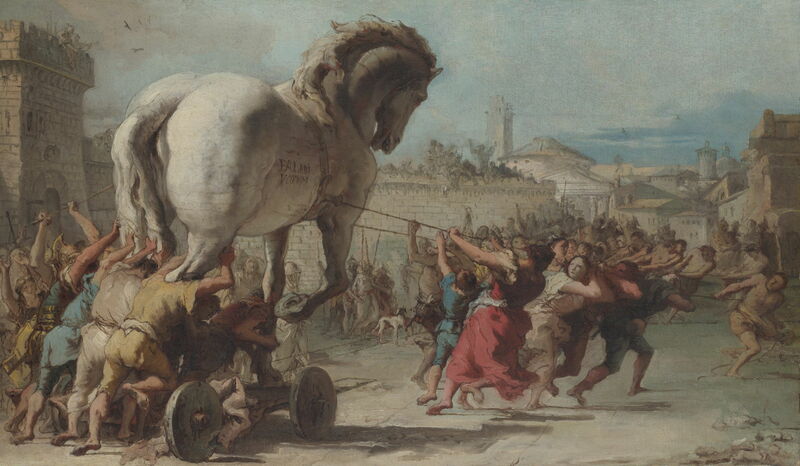 At the end of this period Odysseus (Ulysses) had the idea of building a wooden horse, into which Greek soldiers would be placed, in order to get them into the city: the Trojan horse. 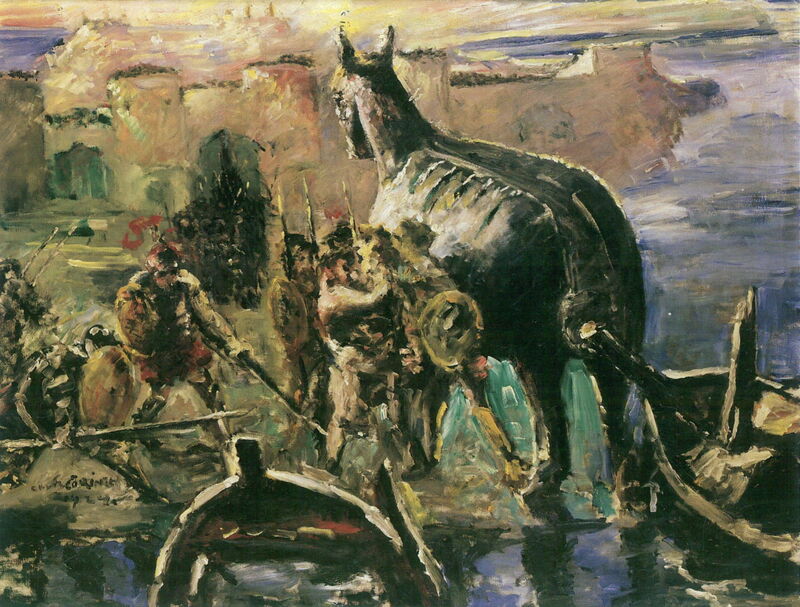 Lovis Corinth (1858–1925), The Trojan Horse (1924), oil on canvas, 105 × 135 cm, Staatliche Museen zu Berlin, Berlin. Wikimedia Commons. The Greeks landed this horse on the shore, and sailed off, apparently leaving it as a peace offering. In fact they sailed only just out of sight, and waited. Giovanni Domenico Tiepolo (1727–1804), The Procession of the Trojan Horse in Troy (1773), oil on canvas, 39 x 67 cm, The National Gallery, London. Wikimedia Commons. The Trojans hauled the horse up and into the city, dismantling some of their defences to get it through the walls. They then went and drank and feasted what they had presumed to be their victory. While the Trojans were busy getting drunk, the Greek soldiers inside the horse let themselves out through a trapdoor, lit signal bonfires to summon the Greek ships, and opened up the rest of Troy’s defences. The Greek army poured into the city as its inhabitants were still recovering from their partying. The city was sacked: all the precious metals and jewels were stripped, the temples desecrated, most of its population murdered, and the buildings were set alight. 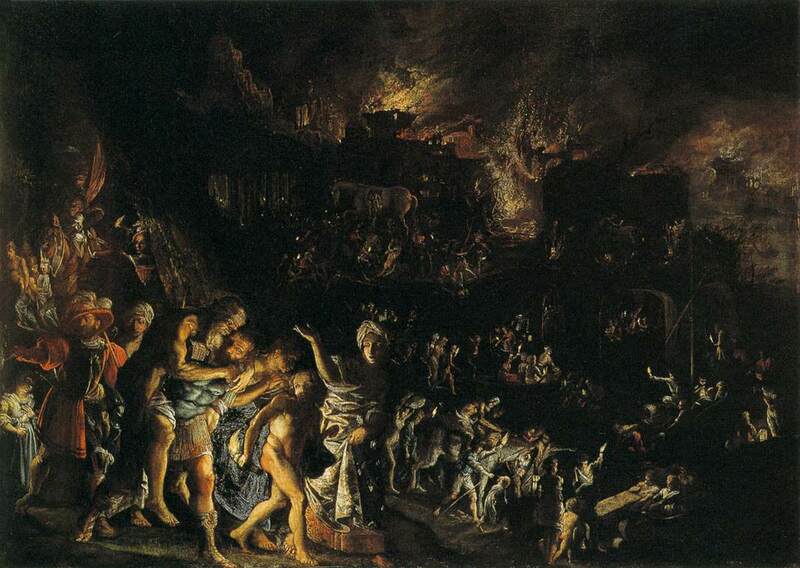 Adam Elsheimer (1578–1610), The Burning of Troy (after 1601), oil on copper, 36 x 50 cm, Alte Pinakothek, Munich. Wikimedia Commons. 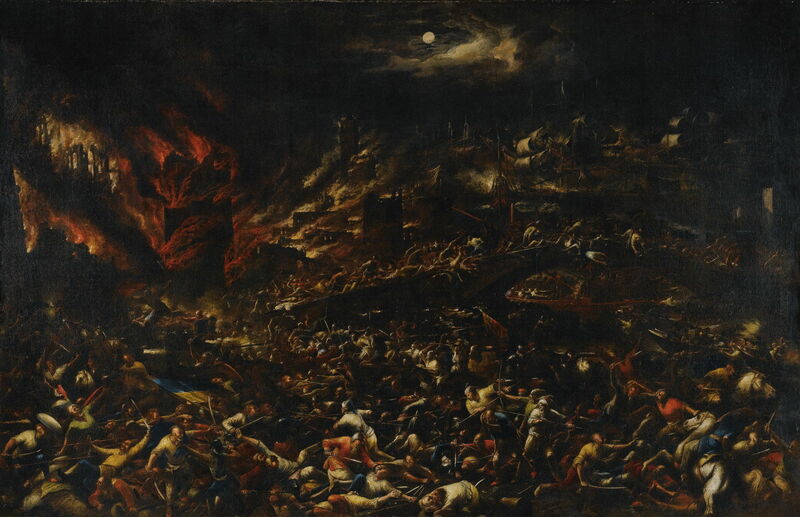 Gillis van Valckenborch (attr) (1570-1622), The Sack of Troy, oil on canvas, 141 x 220 cm, Private Collection. Wikimedia Commons. Some prisoners were taken. Andromache, widow of the great Trojan warrior Hector, was given to Neoptolemus, and Hecuba, Priam’s widow, to Odysseus. Astyanax, infant son of Hector and Andromache, was killed by being thrown from the city’s walls. Frederic, Lord Leighton (1830–1896), Captive Andromache (c 1886), oil on canvas, 197 x 407 cm, City of Manchester Art Gallery, Manchester, England. WikiArt. The dominant aim was to completely destroy the city of Troy and its lands, and to kill almost all of its people. It was calculated genocide. Anonymous, Revil Cista (325-250 CE), bronze casket, 36.5 x 24.5 x 9.5 cm, found in Palestrina, Lazio, Italy, now in The British Museum, London. Image by courtesy of and © Trustees of the British Museum. The original image has been turned into a negative to help distinguish the marks, which show Achilles sacrificing the Trojan prisoners before Patroclus’ pyre. [Achilles] drew twelve youths alive out of the water, to sacrifice in revenge for Patroklos son of Menoitios. He drew them out like dazed fawns, bound their hands behind them with the belts of their own shirts, and gave them over to his men to take back to the ships. The Etruscans, who populated much of what is still known as Tuscany in Italy, formed as a civilisation from about 800 BCE, roughly the same time as the classical Greek civilisation was forming, and around five hundred years after the supposed fall of Troy. At this time, Rome consisted of small settlements, and the city of Rome was traditionally supposed to have been founded in 753 BCE, becoming a mighty Republic in about 509 BCE. The origin of the Etruscans remains controversial. Among several proposals, it has been suggested that they may have viewed themselves as descendents of the survivors of Troy, and there has been some genetic evidence to support that (and some to contradict it, too). There is no doubt that, at the time that this tomb was constructed, these Etruscans were greatly influenced by the Greek civilisation, and had earlier been resisting the rise of Rome. However, the popular idea that the Romans obliterated the Etruscans in another wave of genocide is incorrect: from two centuries before this tomb was built, the Etruscans had been steadily integrating with the Romans, and were assimilated (often in positions of power and influence) rather than exterminated. There are two halves or faces to this tomb: the Etruscan, celebrating heroes who fought against allies of Rome, and the Greek/Trojan, recording the Greek sacrifice of Trojan captives. The story behind the paintings as a whole thus depends on whether the Etruscans thought themselves to be Trojan, or Greek. If they thought themselves to be Trojan, one explanation is that the paintings told the story of their survival against the odds, the few who escaped the genocide, and the heroes who resisted against Rome. If they thought themselves to be Greek (or Greek sympathisers), they could be paying respect to the Greek warriors who ensured the destruction of Troy, just as their own local heroes had stood up and fought against Roman allies. It all depends on where the Etruscans of that time thought that they had come from. Moreover, we do not know who these paintings were made for, but they were certainly never intended to be seen by the likes of you and I. You may also be surprised to see a winged angel of death in the paintings. Vanth, that goddess of death, is one of the more common figures shown in Etruscan tombs. My next article will look at how she came to be there, and how – seven hundred years later – Christian angels spread their wings. Wikipedia on the Trojan War. Wikipedia on the Etruscan Civilisation. Bryce T (2006) The Trojans and their Neigbours, Routledge. ISBN 978 0 415 34955 0. Lowenstam S (2008) As Witnessed by Images. The Trojan War Tradition in Greek and Etruscan Art, Johns Hopkins UP. ISBN 978 0 8018 8775 8. Haynes S (2000) Etruscan Civilization. A Cultural History, J Paul Getty Museum. ISBN 978 0 892 36600 2. Holliday PJ (1993) Narrative Structures in the François Tomb, pp 175-197 in Narrative and Event in Ancient Art, ed Holliday PJ, Cambridge UP. ISBN 978 0 521 43013 5. Rouveret A (2015) Etruscan and Italic Tomb Painting c 400-200 BC, pp 238-287 in The Cambridge History of Painting in the Classical World, ed Pollitt JJ, Cambridge UP. ISBN 978 0 521 86591 3. Posted in General, Painting and tagged Etruscan, genocide, Greek, Iliad, narrative, painting, Roman, Troy. Bookmark the permalink.